Oklahoma Sooners single-game football tickets went on sale earlier this week, and ticket prices ain’t what they used to be. Last year the Sooners finished with the eighth most expensive tickets in college football, with an average resale price of $118. This year, however, the team is currently 31st, with an average resale price of $97. The most expensive home game for the Sooners this year is currently against TCU Nov. 21, with an average resale price of $146. The only other home game close to this is a Oct. 3 matchup with West Virginia that has an average resale price of $139. The cheapest opportunity to see Oklahoma at home is the opener against Akron Sept. 5, when the average seat has resold for just $60. 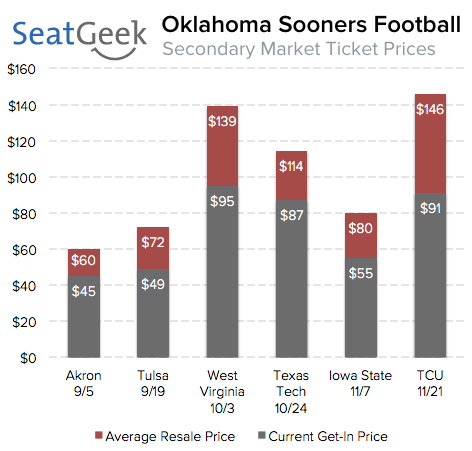 The chart below shows the average ticket price and get-in price (cheapest ticket for sale) for each of Oklahoma’s home games. Prices are much higher to see the Sooners on the road. The October 10 matchup against Texas at the Cotton Bowl is the ninth most expensive game in college football, with an average resale price of $322. Away games at Oklahoma State ($210), Tennessee ($198) and Baylor ($152) are all more expensive than any Oklahoma home game. Expectations are down for the Sooners, and so too are prices, with the average overall ticket reselling for just $97 so far this year. Fans have also been slow to buy tickets on the secondary market, with just an estimated $200,000 spent on the secondary market so far. At this point last summer the average Oklahoma ticket had resold for $154, and an estimated $500,000 had been spent on the secondary market.